The Original World Famous Brighton Punch and Judy Show is performed by ‘Prof’ Glyn Edwards who has performed for over 50 years throughout the UK as well as all over the world. He has been dubbed a “Punch and Judy Rock Star” – although it’s Mr Punch who is the charismatic crowd pleaser, Glyn is just his sidekick. Brighton and Mr. Punch have gone hand in hand for nearly two hundred years and the Brighton Punch and Judy family are delighted to be carrying on the tradition on such a historic pitch. The fun filled show has been featured at diverse venues all over the world from Dubai to Texas, and – of course – on Brighton beach where it now has a permanent base in the seafront’s Fishing Museum. Come and see the show on the beach or book a party rate in the Punch & Judy Room at Brighton Fishing Museum at Kings Road on the seafront. Find Punch & Judy outside the Fishing Museum then join Mr. Punch’s Fishing Quarter Treasure Hunt ending up inside the museum for more puppet antics with Dog Toby’s Tailpiece. 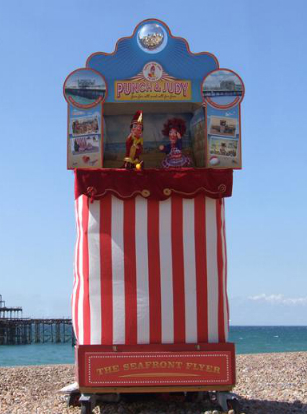 The Brighton Beach Punch & Judy is available for event hire by special arrangement. Never been pottery painting before? All ages are welcome at the Painting Pottery Cafe and with a million masterpieces already created, they can help you make one of your own! Choose from over 200 different ceramic pieces including plates, mugs, bowls, vases and ornaments. The studio fee is £5 per person (this covers glazing and firing) and most pottery falls between £10 – £20 including mugs, bowls and plates. There is a wide selection of pictures, stencils, transfers and sponges to help and more colours than you’ll ever need! Fully trained studio assistants are on hand to offer advice and support. When you have finished your masterpiece staff will glaze and fire it and you can collect your pottery a few days later. Alternatively, some items can be decorated with acrylic paints and taken home on the same day. 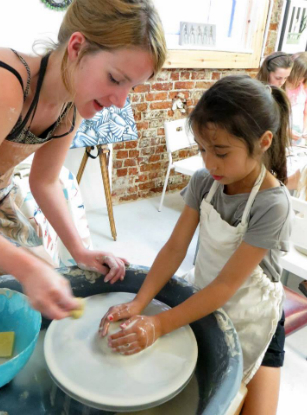 Also, why not try pottery throwing and clay sculpture workshops for children and adults. As with everything we do, there’s no need to be an artist – just turn up and let your imagination run free. 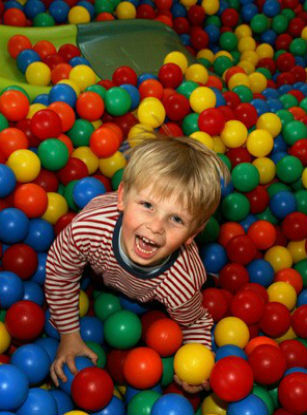 Westows is an indoor play centre for children that focuses on old-fashioned play. At Westows you will find a large two-level play area, separate soft play area for under 4s, two indoor football pitches with bouncy castle and toys, and plenty of space for children to run around. There is a large canteen next to the play equipment and for the adults there is free wi-fi so you can get on with your own thing while the kids play. Featuring two levels of fun, the large play area has been uniquely designed, with a height restriction of 4ft 10 for the children’s own safety and comfort. The other area is strictly for children aged 3 and under. Older kids are not allowed in, to allow the little ones to play in a safe environment. Many parents bring their children into this area to help teach them to walk. One price covers entry and use of all facilities – Westows aim to ensure their prices are the lowest in the area. They have special summer holiday offers to keep the kids entertained over the holidays, plus adults and non walking babies are free! Stay as long as you like though sessions may be limited to 2 hours on very busy days. Monthly and annual memberships are available. 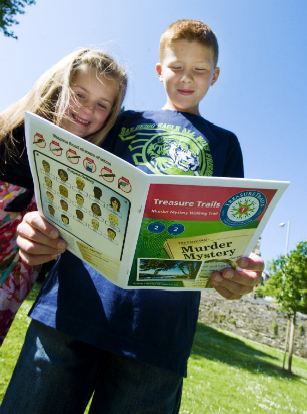 A Treasure Trail is a fun and healthy way to explore Brighton. You can find the hidden treasure, solve a murder mystery, or crack the spy code while exploring the city and its famous landmarks. Whether you are local to Brighton or are visiting for the first time, on a Trail you will discover all the best bits of Brighton, from the Palace Pier to the Pavilion and Lanes. 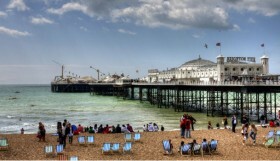 There are two Trails to choose from, either a Seafront Trail or Brighton Cultural Quarter. In the Seafront Trail, meet Hairy John, an infamous pirate and smuggler. Before he was captured he hid a chest of gold and gemstones – your job is to use a process of elimination to uncover the treasure. In the Cultural Quarter Trail, solve the clues to discover the murderer of charismatic theatre owner Darina Dreamer. Trails vary between 1.0 and 2.5 miles and take between one and a half to two and a half hours to complete. Complete your Trail whenever you choose and at your own pace, and at only £6.99 each, they are affordable family fun. Trails can either be downloaded or sent to you in the post or to someone else as a gift. Volks railway was opened in 1883, making it the world’s oldest operating electric railway – it wasn’t the first but it is certainly the longest lasting. It was opened on 4 August 1883 by Magnus Volk, the son of a German clockmaker. Magnus Volk was a 19th century inventor and engineer. He set up the first telephone line in the city in 1879 and pioneered the early use of electricity. As well as building the railway, he brought electricity to his own house in Dyke Road and soon had the Royal Pavilion illuminated in the same way. 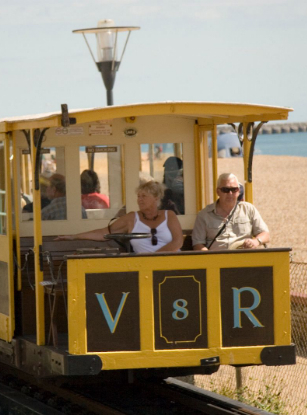 Today the railway line along Brighton seafront is open to the public every year between Easter and September. It can carry up to eighty passengers along the beach for one and a quarter miles. Trains run every day until the end of the season, weather permitting. There are occasionally planned closures due to major events on the seafront, for example the London to Brighton bike ride. The railway has three stops: the Aquarium Station, Paston Place (at Peter Pan’s playground half way along Madeira Drive) and Black Rock Station which is only five minutes’ walk from Brighton Marina. 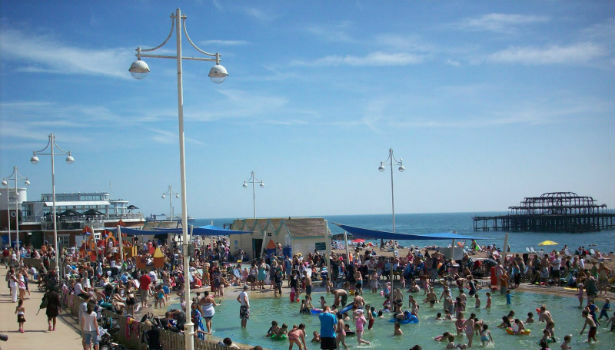 Kings Road Playground is situated right by the beach on the west side of the West Pier. It is fully enclosed, with a paddling pool and loads of great playground equipment. Cafe’s and toilets are nearby. 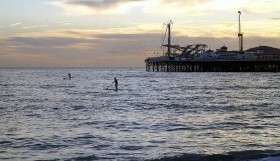 It’s a firm favourite with Brighton locals and is always busy during the summer. The Level re-opened in summer 2013 with fantastic new facilities including the Velo Cafe and a lovely playground, situated at the south end. The playground is fenced and has a water drinking fountain, bins and picnic benches. Perfect for an after-school visit or a weekend day out! 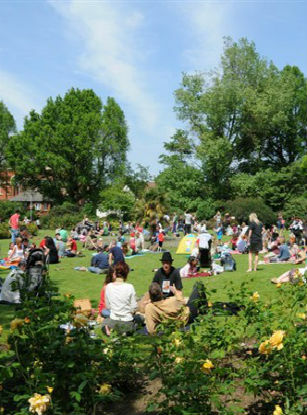 St Ann’s Wells is a short walk from Hove seafront. It is a treat for tree-lovers and will appeal to young and old alike. Nature conservation is important in the park – there are fenced off areas, a scented garden for the visually impaired and a well stocked pond with a biological filter system. Blakers Park is a delightful green oasis, tucked away at the top of the Preston Park hill with stunning views of the sea. It features a fully enclosed playground with large sand pit, a cafe, and toilets. There are also two hard tennis courts which are free to use, so Blakers is great for children of all ages. Great for a rainy day or a bit of educative fun, here are our top picks for museums around Brighton. 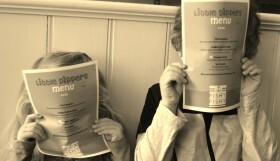 Most of them are free, or very reasonably priced, making them an easy and inexpensive outing for all the family. Brighton Museum & Art Gallery is set in the heart of the city’s cultural quarter, located in the Royal Pavilion gardens. Its rich collections and exciting exhibits are dynamically displayed in stimulating surroundings. Exhibits include Ancient Egypt, renegade fashion and a host of family activities are available. Entrance is free. Booth Museum of Natural History is situated north of the city centre on Dyke Road. Over half a million specimens and natural history literature and data extending back over three centuries are housed in this fascinating museum, including hundreds of British birds plus butterflies, skeletons, a whale and dinosaur bones. Entrance is free. Hove Museum is situated in Hove just a short walk from St Andrews Church. Step into a world of toys, cinema, local history, and fine art. 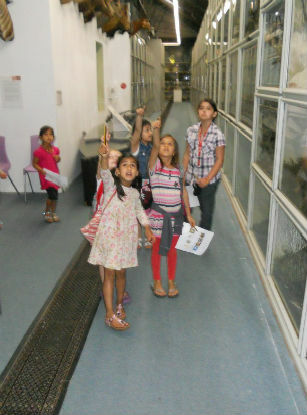 It is one of the most family friendly and accessible museums in the south east with an unusual Indian gateway in its grounds. It also boasts one of the finest craft collections in the country, and is an oasis of learning and enjoyment for everyone. Entrance is free. Brighton Toy and Model Museum is tucked away underneath Brighton Train Station. It is a treasure trove of toys and models, inside four of the Early Victorian arches supporting Brighton Railway Station’s forecourt. It has over ten thousand toy trains, vehicles and curiosities, and two large operational model railway layouts. 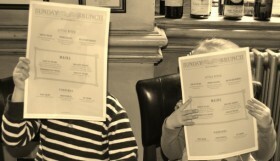 Under 4s go free, prices start at £3.50.